Hello! 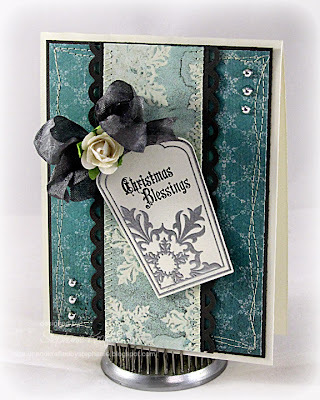 Today I had a chance to play a little, so I created this card using some of my new Verve goodies! I used Verve's Glad Tidings. I was inspired by Mona's creation for her latest challenge, so I stamped and embossed my tag with silver embossing powder. I then used the new A Cut Above Sweet Scalloped Tag die to cut out the tag. 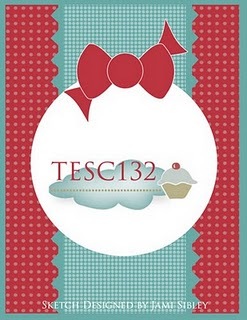 The long strip underneath my tag was created by stamping two of the snowflakes (also from Glad Tidings) and embossing them with clear embossing powder. I then sprayed the entire strip with Mint Chocolate Chip Chalkboard Glimmer Mist to achieve the emboss resist effect. I tied a dyed seam binding ribbon bow and added a Prima rose to the top of the tag. Finally, I added some stitching and shiny silver pearls to finish off my card. 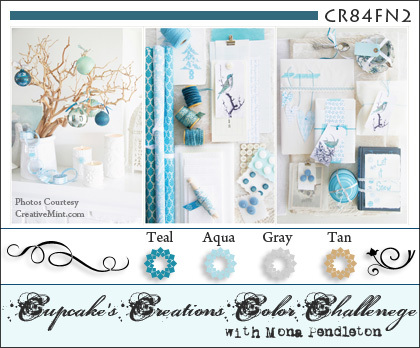 I made my card using the colors from Mona's latest challenge, CR84FN2 (see the yummy colors of the graphic below). I also used Taylored Expressions Sketch #132 (also below). Thanks so much for stopping by! I'll be back tomorrow with a card for the JustRite Friday Challenge! Accessories: Sweet Scallop Tag Die (Verve), Apron Lace border punch (Fiskars), Clear and silver embossing powder, Dyed seam binding ribbon, Rose (Prima), Silver pearls (Pizzazz Aplenty), Mint Chocolate Chip Chalkboard Glimmer Mist (Tattered Angels), Foam tape, Thread, Sewing machine. This is just so beautiful and elegant, LOVE it! This is gorgeous, Steph! Don't you love this set and die? I LOVE it!!! Absolutely outstanding card, Stephanie! The colors are so rich and the stamping is gorgeous! I think I found my favorite! Positively gorgeous, Stephanie! Love it! Gorgeous! 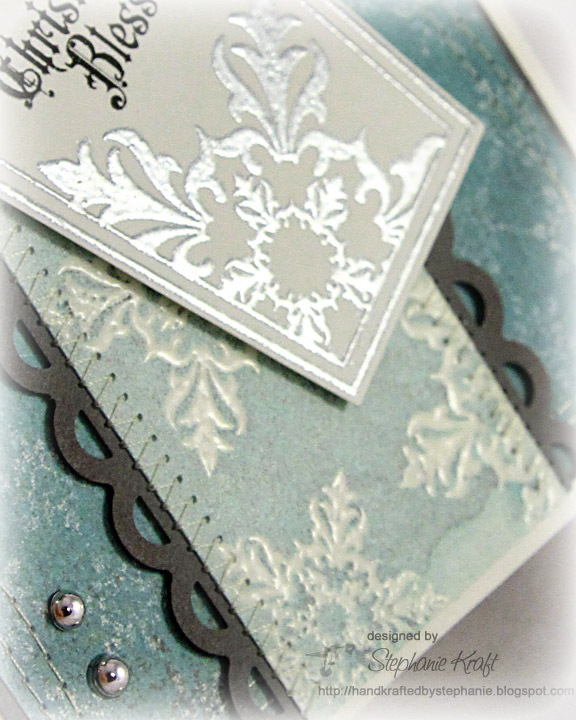 Love the silver embossing on the tag and the lovely patterns.